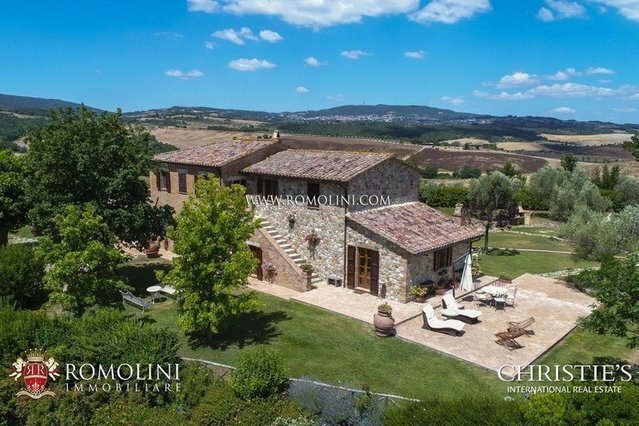 In the Sienese countryside, a short distance from the medieval town of Chiusi, this typical 19th century farmhouse offers 600 sqm of surface and 6 bedrooms to be used as a private residence or, alternatively, as a hosting business thanks to the beautiful view offered. The property is completed by a 12 x 6 m swimming pool, an olive grove (180 trees) and a 12-row vineyard. GEOGRAPHIC POSITIONOn the hills of the Sienese countryside, not far from the medieval town of Chiusi, typical Tuscan farmhouse in panoramic position with swimming pool, small vineyard and park.The farmhouse is located atop a hill and offers a unique view over the surrounding countryside. The proximity with the A1 highway (4km) grants the possibility of moving in all freedom in every corner of Italy and a small town in the vicinity (3km; 10rsquo;) offers all the necessary services. The most renowned towns and cities of Tuscany are all at hand and reachable in less than two hours: the medieval hamlet of Chiusi (8km; 15rsquo;), the wine town of Montepulciano (18km; 30rsquo;), the papal Pienza (28km; 40rsquo;), Montalcino with its prestigious wine (45km; 55rsquo;), the medieval Siena (81km; 1h 10rsquo;) and the Renaissant Florence (125km; 1h 50rsquo;).The most useful airports are Firenze Peretola (141km; 1h 35rsquo;), Roma Ciampino (175km; 2h), Roma Fiumicino (190km; 2h), Pisa Galilei (201km; 2h 15rsquo;) and Bologna Marconi (222km; 2h 20rsquo;).DESCRIPTION OF THE BUILDINGSThe entrance to the farmhouse (450 sqm ndash; 4,842 sqft) has been obtained from the reworking of the old barn. From here, through an orangery, one get to the residence itself, laid out onto two floors:- Ground floor: living room with fireplace (once the stables), living room and kitchen. The old orangery has been fully renovated, converted and split into three rooms: TV room and guest apartment with living room and bedroom with en-suite bathroom (here can sleep up to 7 person since in the living room there are two sofa-beds).- First floor: master bedroom with en-suite bathroom, three more bedrooms and ample bathroom.In a underfloor level(150 sqm ndash; 1,614 sqft) one can find a garage and a technical room for the systems of the house.STATE AND FINISHESThe farmhouse, dating back to the beginning of the 19th century, has been attentively and finely restored in 2000 to recover and valorize those characteristics making the Tuscan farmhouses unique.On the outside the farmhouse is made out of stone and masonry, with several French windows leading to the garden and, in turn, the nearby swimming pool. An outdoor staircase leads directly to the upper floor.Works have been conducted even on the inside to preserve the aspect of the building untouched. It boasts handmade terracotta floors, brick-built arches connecting the rooms, painted wooden doors and original wooden beams. Bathrooms boast modern fixtures clashing with the exposed stone walls. Ceramic tiles visible throughout the house have been realized by Sicilian artists taking original 18th century motives as a reference.EXTERNAL AREAThe property comes with 3 hectares of land. Right around the farmhouse, encircled by walls, hedges and feces, there is a beautiful garden designed so as to valorize the view over the unrivaled Sienese countryside. The 12 x 6 m swimming pool is located on the eastern side of the garden, on a slightly lowered terrace, and is surrounded by a nice lavender hedge which hides it from prying eyes.The access is granted by an unpaved road which is embellished in its last section by two rows of cypresses, as one often sees in Tuscan farmhouses.Of the 3 hectares of land, a section (approximately 8,000 sqm) is covered by an olive grove (more or less 180 trees) while on the northern portion there are 12 rows of vines (approximately 2,000 sqm). It is however possible to extend the vineyard, since almost half of the land is not currently used.USE AND POTENTIAL USESThe farmhouse, thanks to its beautiful location in the Sienese countryside, is perfect for anyone looking for a private residence granting a nice level of privacy without giving up on services and comforts. Alternatively, thanks to an excellent internal repartition, the farmhouse could be (entirely or partially) rented out to tourists looking for relax in one of the most sought landscape of the world, especially if someone is fleeing the chaos of crowded cities.